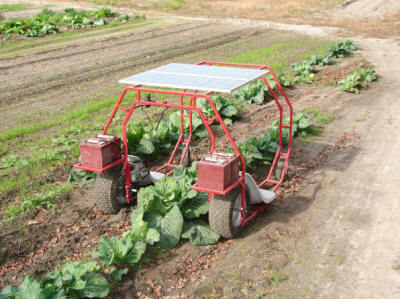 This is a really innovative machine to help with garden chores like planting, weeding, and picking. 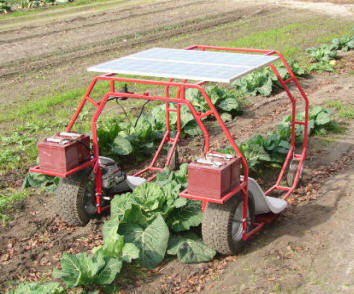 Its not only helpful, but is also solar powered! Thanks very much to Randy -- better known as the PD-Riverman on The Homesteading Forum for providing the details on this machine. I really Love gardening but I have a bad back and when it comes to staying bent over in the garden it gets rough. So I built this Helper Machine. I call it My P-Machine. 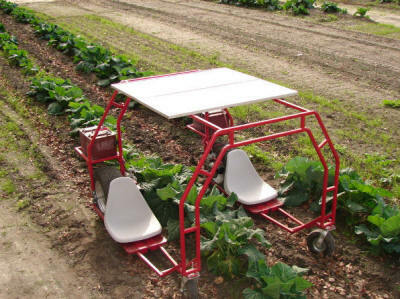 Planting/Picking/Pulling weeds/Putting around the garden machine. The machine was fabricated out of 1" square tubing 1/8" thick. This was my first build using a welder and tubing bender so do not look at the welding to closely. The two seats are adjustable---they will move several inches closer to the row middle or several inches farther away. The drive motors, wiring harness and control were removed from a power wheel chair. The two motors operate on 24 volts and are already a gear reduction motor. Since I was using a larger rear tire than is on the power wheel chair and I wanted a lot of torque I reduced their output even more to 4.6 to 1 by using a 13 tooth sprocket on the motor and a 60 tooth on the wheels drive axle. A #35 chain connects the sprockets. The machines top speed is about the speed of a walk but can be slowed down to a craw by using the original wheel chair speed adjust control with the joy stick pushed all the way forward. Naturally it will stop by releasing the joystick or returning it to its centered position. The machine works like a Zero turn lawn mower or a rear drive power wheel chair meaning the front tires swivel as the rear tires control the turn. No need for front wheel steering this way. The Control can be moved easily from one side to the other so I drive it from either side. The control can also be moved to the middle. I have four T-105 6 volt Trojan golfcart batteries on two racks above/behind the drive wheels so that less weight will be put on the front swivel tires. The four batteries are hooked in series for 24 volt set-up. 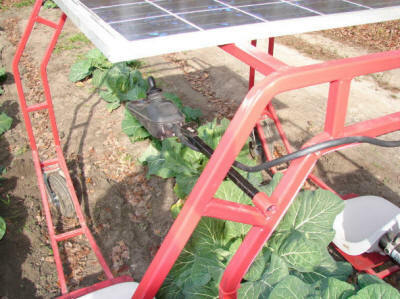 I am using two 12 volt 80 watt solar panels hooked in series that will run through a 20 amp 24 volt charge controller to keep the batteries charged properly. The wiring was simple because I used everything off the power wheel chair including the wiring harness. I had to lengthen the wires some because this machine is so much bigger than the wheel chair. 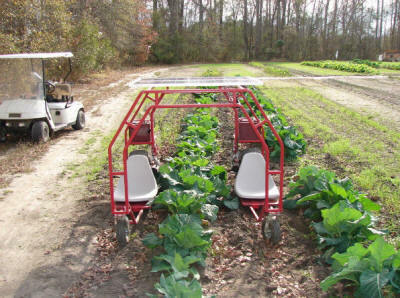 The 24 volt battery set-up was wired to the original battery disconnect plug that was on the wheel chair battery pack, so its just a simple plug into the harness. 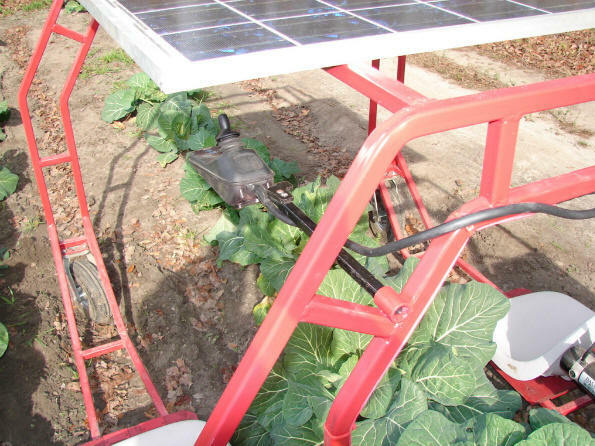 The 24 volt solar charge controller wires hooks to the batteries in the same place as the positive and negative wires for the disconnect plug. I had the 4 Trojan batteries, but I could also have used two 12 volt deep cycle batteries. Or, I could have used the original batteries off the wheel chair, but those batteries were going bad. So, I used what I had. I am sure the run time will be a lot longer the way I have it set-up. After testing it, I have plans to do some more to it to make it more useful. I think it will help me so much in my BIG garden.